I've already reviewed Life in the Trinity, so I'm reposting that below (which explains why this review is a wee bit longer and more detailed than the others). 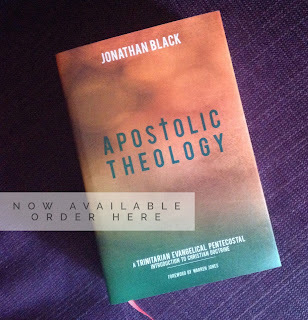 Appropriately for the nature of the book, I'll be giving it away after Monday morning's Bible teaching. All you have to do is find me and ask! The next time I teach an introduction to theology, this is the book I’ll make my students read. At less than 250 pages, Fairbairn’s book is far from a complete Systematics and, in fact, it bears very little resemblance to other comparably sized introductions (like Frame’s Salvation Belongs to the Lord or Grudem’s Christian Beliefs). Life in the Trinity isn’t a bite sized overview of all the individual doctrines of systematic theology, but rather a glorious glimpse of the big picture, a big picture well summed up in four words in the title: Life in the Trinity. For some reason, many evangelicals seem to have a bit of a fear of the church fathers, so Fairbairn’s subtitle, ‘An Introduction to Theology with the Help of the Church Fathers’ might seem a bit scary. But it shouldn’t. As the influential evangelical leader John Stott once put it, ‘to be disrespectful of tradition and of historical theology is to be disrespectful of the Holy Spirit who has been actively enlightening the church in every century’ (Stott, The Cross of Christ, p.17). There is much we can learn from the church fathers, just as there is much we can learn from the Reformers and others throughout church history. In fact, it might even be east to get the wrong impression about just what this book is from the subtitle. Fairbairn doesn’t set out to teach theology from the fathers, but ‘with the help of’ the fathers. Although he is an historical theologian with great respect for the fathers, Fairbairn is also an evangelical and is careful to root his theology in Scripture. In fact, such Scriptural rootedness is even clear from the structure of the text: while the words of the fathers are usually to be found in sidebars, the main text deals with the Scriptures. Perhaps the biggest influence of the church fathers on the book is in the choice of subject matter and the nature of the big picture approach to theology. As I’ve said, this book doesn’t look like other short introductions to theology. Although it does generally move through the broad loci of systematics, it does it in rather a different way than what you’re probably used to. Each locus is looked at in relation to the Trinity. So the Trinity isn’t just a topic for a few pages in a section on the doctrine of God, but rather it is the doctrine of God and takes in every other locus too. This is a Trinitarian theology, not in the sense of not being Unitarian, but in the sense of all of its theology having a solidly Trinitarian shape. As Fairbairn makes clear in the title of chapter two, ‘The Heart of Christianity’ is ‘The Son’s Relationship to the Father’. Fairbairn, standing in the tradition of Irenaeus, Athanasius, Augustine and Cyril of Alexandria, sees the Christian life in terms of theosis. And he’s very careful to explain what he means by theosis too. He freely admits that there were other conceptions of theosis among some of the fathers (see pp. 8-9), but what he’s advocating is ‘participating in the Father-Son relationship’ (p.11), ‘sharing the love between the persons of the Trinity’ (p.11) or ‘becoming sons and daughters by adoption so as to share in the communion that the natural Son has with God the Father’ (p.10). 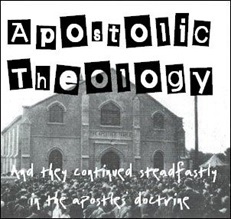 Although theosis might not make it into many conservative evangelical systematic theologies, it is fully compatible with our Reformation soteriology, and, for my Apostolic readers, it was a common concept in the writings of our founding fathers too. 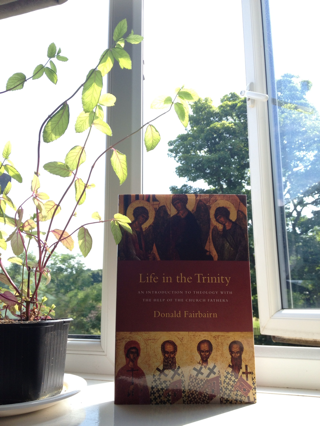 So, Fairbairn paints a compelling big picture of the Christian life and faith in terms of the Trinity and theosis. Let me just give you a few quotes to get a feel of how. Anyway, I have so much good to say about this book that I could go on for ages, so I won’t. Fairbairn writes clearly and engagingly, and knows his audience – he’s writing as an evangelical for evangelicals, so he takes concepts that aren’t always much emphasised by evangelicals (like the Trinity, theosis, Christ in the Old Testament, and the centrality of the Lord’s Supper) and presents them in a way that makes sense to evangelicals. I suppose in a book review I should really find some point on which to quibble. And there is one. But I hesitate, as it really doesn’t detract from the overall immense value of this book. My one slight quibble is his chapter on the Old Testament (chapter 6). And even here, it’s not what he says, but what he doesn’t say. Fairbairn says a lot of good stuff here, I’d just have liked him to go even further, particularly as regards seeing the Trinity and Christophanies of the pre-incarnate Son in the Old Testament. However, perhaps what Fairbairn does say here about the Old Testament as a book about Christ is already rather radical for many contemporary evangelicals. So, laying aside that one minor criticism, as you can undoubtedly tell by now, I loved this book. I’ll definitely be reading it again, and will try and make other people read it too. Too often we break the Christian faith up into a collection of individual doctrines, but Fairbairn does an excellent job of showing the big picture where all of Christian doctrine and life fits together in our life in the Trinity.